"Librarianship is a form of activism. Our professional ethics are activist through and through. Look at the Freedom to Read Statement or the Code of Ethics. Objectivity, looking at the world from a positivist stance, is important - but being neutral about what you see is absurd. I spent a good part of my twenties well aware of the problems of the world, but largely convinced that the 'adults' were working on it. Now that I am in my thirties I can see that each and every one of us has an obligation to work to build that better world - the one that an objective look at reality (consider climate change) shows is increasing urgent", Mandy Henk says in the interview "Occupy Wall Street Librarians Talk About Feminism, Activism and Librarianship" for Women in libraries. 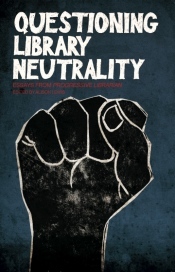 If you want to read more about librarianship and activism, I recommend the anthology "Questioning Library Neutrality: Essays from Progressive Librarian" edited by Alison Lewis at Library Juice Press.